Sean Lau Ching Wan two nights ago attended a shopping center Christmas lighting ceremony. 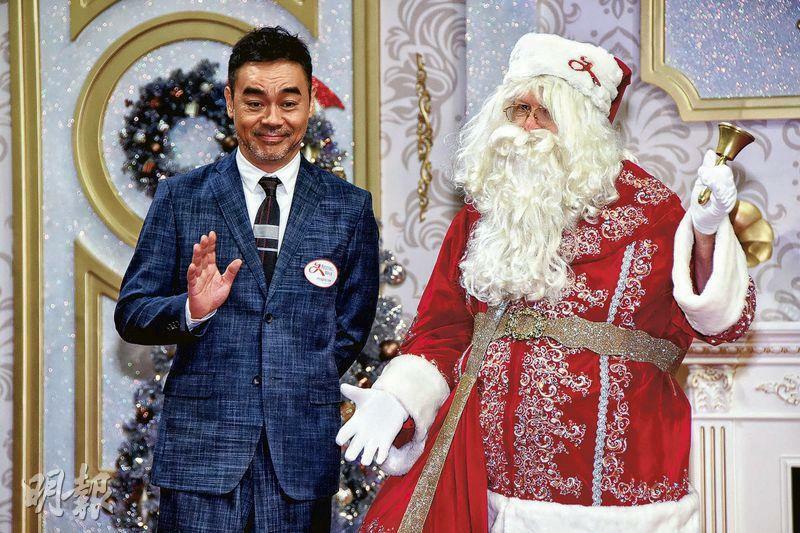 He performed magic on the stage and revealed that ths year he and his wife Amy Kwok Oi Ming would consider celebrating their 20th wedding anniversary with a Christmas in Finland. Just completing his new film, Ching Wan joked that he was worried about the cold and thus has not decided on whether to go to Finland. He said, "I heard that a popsicle would not melt from 9 in the morning to 9 at night, but I am the most afraid of coming from and going to indoor places. I would have to put on and take off clothes. With the cold the skin would be drier." As for how he would celebrate his wedding anniversary, Ching Wan said that it would probably be a dinner with friends. He said that time flew as several years went by in the brink of an eye. Did Ching Wan and his wife maintain their first love feeling? "No, 20 years just went unknowingly." Ching Wan said that he did not deliberately buy a gift for his wife. He admitted that anything that would catch his eyes and he could afford, he would have bought it already. If not, he could not afford to buy it even on holidays. Speaking of friend Louis Koo Tin Lok being nominated for a radio music award for male singers, Ching Wan said, "Great, he can develop in different areas. I remember hearing him sing once, he's OK." Did he feel that Goo Jai would be a waste not becoming a singer? "That's up to him to choose, he can become a singer and not make movies, leaving them for us to make. However Boss Koo is very smart. He knows what to do." Ching Wan has sung in a movie with Koo Tin Lok and Nick Cheung Ka Fai. Would they form a band? Ching Wan joked that they would destroy the music scene. He said that Goo Jai and Ka Fai could sing, but he had no talent and did not enjoy singing.